Last time I shall do this I suppose, how vexing. Bag packed, check, camera, phone and tablet charged and in clothing, check, passport and green card, check, zippers done up, check. So many things on the check list as I get ready, it’s second nature now. Am wearing gifts from family, Seb’s good luck Eagle charm, Nat’s restaurant t shirt, J’s bug bracelet, I am good to go, good to go. Mount up and away we go in in our Ambasador, an Indian classic car, with new pal, Santosh Mina. Uh oh, he is already talking about his caste, this might prove interesting. Good roads out of city, there is even a bus lane, big direction signs, like on the freeway, mostly squiggly Hindi, but some in English. A big overpass, not exactly Dallas style, but worthy of a photo. Two road blocks as we pass out of the city, waved thro both, and to first gas station. Alright, I don’t have to pay like I did in Kerala, also I did check on Santosh’s sleeping arrangements, it’s sorted, he won’t have to ask to sleep with me ! Villages again, enlivened by the colorful clothing, just passed a dirty dun colored bus that positively exploded with the lady’s clothing, like a bright light had been turned on inside. There are camels on the road side and huge bullocks on the central divide making eye contact as we pass. An hour out of Jaipur and the roads are still good, two lanes in each direction with a central divide, tho for some reason we keep meeting autos coming the wrong way on our side. We are thundering along at 90 kph, for three minutes, then more construction and our speed halves. The wheat is being harvested on either side, acres and acres of it, destined for chapatis I guess, I wonder how many are consumed each day. 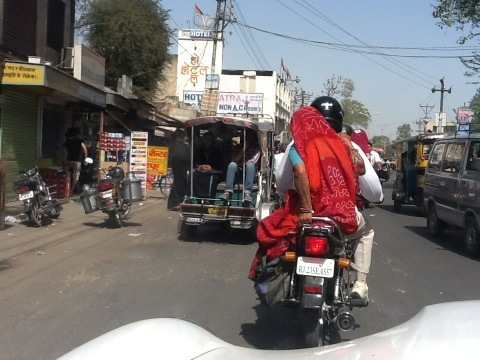 Stopped three hours into the drive for food and water at Sikar, a busy looking town. Looked it up in book and it seems there are over two million people here, it has gaily painted tuk tuks too. Had a half of a very good samosa, pastries and a bottle of water in the Madras Sweet Shop. After Sikar the landscape has changed, no more wheat fields, it’s a kind of scrub, stark looking trees, the goat herds are larger and there are more of them, it’s beginning to get sandy. The road is good, I think we are making good time, one seventy five kms to Bikaner. Another stop at Fatehpur, which looked like the proverbial one horse town, and I was reluctantly sent off with a boy. Come come he cried, oh no, not more shopping. A few steps away I stepped back five centuries, the palaces of the nawabs , rich traders from the Fifteenth Century, are still there, all four hundred of them. Fantastic painted scenes, of gods, of legends, of the nawabs, Mr and Mrs Nawab and their little nawab children. There were so many of them, we walked round what one could describe as a block, and saw ten or twelve in various states of repair.It was a bit like how one images Merry Auld England back in the Middle Ages, perhaps being on the set of Shakespeare in Love, do i have my era correct? 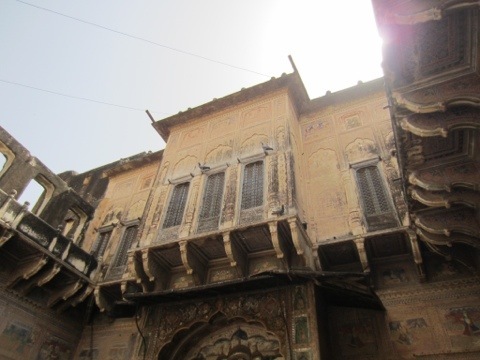 Fortunately some of the Havelis have been restored and are occupied, by rich people, others, not restored and falling down, are also occupied, by families. I loved it, I smiled, I gaped, I gave the boy two dollars. I asked some small children how they were, I’m fine they replied. Back into the car and on into the desert, we are not really there yet, I have seen dunes, there is a minimum of vegetation, trucks lumber past the restaurant where we have stopped for lunch. I am the only one here and got the perfect curry, another one, conveying the level of spiciness with, yes spicy please and putting my figures in my ears saying, no steam! It raises a laugh and seems to work. 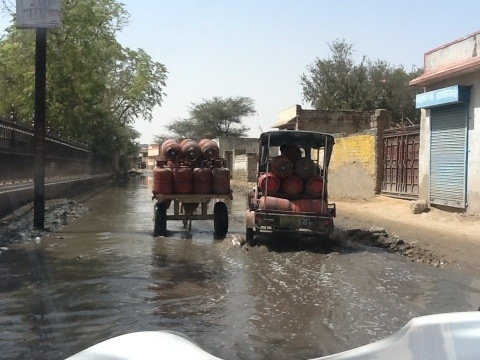 On to Bikaner. We arrived, at about five in the afternoon, was shown to room, up and up, then further up, until, what a view. The bannister is too hot to hold on to, and the stairs are very steep. I chose the hotel quite randomly, Bikanar (rhymes with beak) was not on my original schedule, it’s called the Bhairon Villas, and sounded quite inauspicious, but it looks just fine. Everyone is watching the cricket, India vs Pakistan, so big rivalry, I can’t get a cup of tea ! There seems to be a restaurant and a bar, so far so good. Oh, and there is a ’34 Chevy in the garage, keen car collectors the Indian hoteliers. Will post this, go explore, then see how the photos are looking. Will add them later after a quick wander. An unoccupied Haveli in Fatehpur. 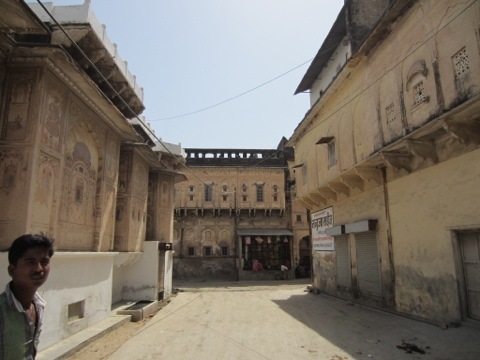 An occupied Haveli in Fatehpur. 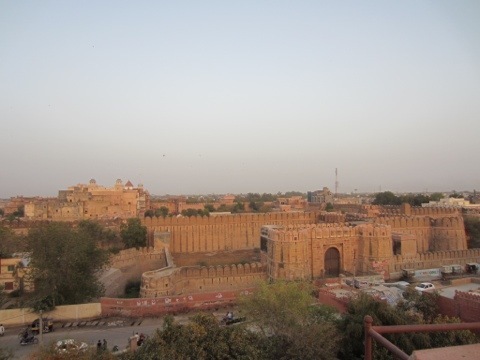 The view of the Fort at Bikaner from my room. It is not all photos of buildings here ! How we hit a flood I have no idea. 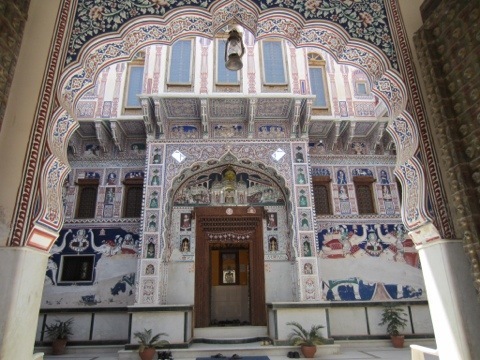 This entry was posted in Bikaner, Jaipur, Rajasthan, solo travel, Thar Desert, Travel and tagged Bikaner, Jaipur, Thar Desert.. Bookmark the permalink. It’s all sounding good! Look forward to the photos. A real treat! Thank you SO much for the Mothering Sunday call at lunch time today. Can’t really take in the fact that you were phoning from the depths of the Great Thar Desert. Would love to see photos of the fort you mentioned on the phone. Do take care tomorrow if you are near the Pakistan border.Stick to the cricket!! I have to say that today’s comment about the anti aircraft guns was put in for your benefit. Just a bit of poetic license. Otherwise all well thanks.